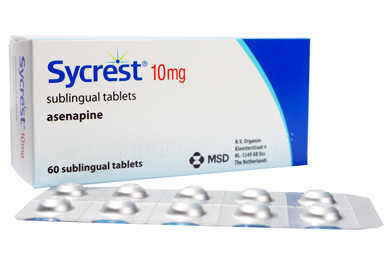 Sycrest (asenapine) is a new atypical antipsychotic licensed for the treatment of acute manic or mixed episodes in bipolar disorder. 1. Sycrest Summary of Product Characteristics, October 2011. 2. McIntyre RS et al. Bipolar Disord 2009;11:673-86. 3. McIntyre RS et al. J Affect Disord 2010;122:27-38. 4. McIntyre RS et al. Bipolar Disord 2009;11:815-26.